Plan B can be advanced. 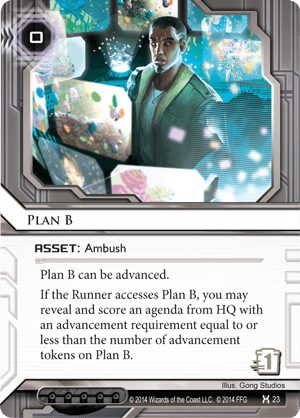 If the Runner accesses Plan B, you may reveal and score an agenda from HQ with an advancement requirement equal to or less than the number of advancement tokens on Plan B. Advancing Plan B during a run makes for a lot of fun. Puppet Master allows you to bump it once just before access. Three Matrix Analyzers on a Plan B, and you can score a 3-point agenda outright, if the runner doesn't chicken out. Watch as your piddling plan appreciates right before your eyes from something unplayable into something score-worthy. No credits needed to fire. As others have said, Plan B is also quite useful in combination with Shell Corporation and Back Channels. All in all, this card is incredibly fun. Plan B is basically unplayable without Mushin No Shin because there is not much point in using it to score any Agenda that only requires two advancements. Because of its dependence on Mushin and its lack of flatline potential it is not often used, even in trap based decks. It costs 0 to activate its ability when the card is accessed. This means runners that think they are safe to run after playing Account Siphon or Vamp can get a rude surprise. I have personally used Plan B in a variety of decks ranging from shell game, NEH Horizontal Spam and even a Cerebral Imaging Mushin recursion novelty deck. It is fun to play and I've scored a surprising number of two-pointers with them. Suggested Ambushes include: Edge of World, Snare!, Psychic Field or Shock! For this combo any Agenda is fine, so IAA and scoring a Clone Retirement on access will trigger the goodness of Edge of World if you want to use it in a scoring server. Don't forget : PE does 1 net damage when the corp scores an Agenda (preferably Philotic Entanglement). On that note if the Corp happens to be broke during access they can still Sponsor a Team of Fetal AIs to do 3 net damage if it will achieve the flatline! Shock! is free to trigger as well. To be honest, this card is quite useless in most decks. Let's look at the ways you can play with Plan B. 1-Install, Advance, Here, you're hoping the runner will leave it alone, as there are no 1 cost agendas. You hope to double advance or triple advance on the next turn. The runner will strongly suspect this is some sort of trap or an awkwardly advanced 3-pointers since you do not score it. Most runners will check it when it has 1 token and not touch it if it's sitting with 3 or 4 tokens. 2-Install, Advance, Advance Runners might be tempted to run an under-protected or naked double advanced asset, but most often than not, they will assume it's a trap and leave it alone. If you then pump it to 3, 4 or 5, you will arouse even more suspicion. The bait will not work. 3-Mushin No Shin + Back Channels It's a viable option, but it involves a four card combo (Plan B, the 3/1 or 3/2 agenda, Mushin and Back Channels if they don't run it). In a Jinteki: Personal Evolution deck it could find it's place. 4-Plan B + Trick of light Again, why don't you play Junebug or some other trap like Cerebral Overwriter instead? 5-The Ultimate Bluff You're Weyland and you're pretending to pull off a Government Takeover. You have a three-pointers or a Vanity Project in hand a Back Channels if they don't take the bait at 6 advancements. NOW we're talking!